Editor's note: The Vega rocket's second flight was originally scheduled for May 3, but that launch opportunity was postponed by weather concerns. European officials say the second flight of the Vega satellite launcher, scheduled for liftoff tonight (May 6), will strengthen the rocket's commercial prospects as it takes off on a complex mission to deploy satellites in two different orbits. Tonight's Vega launch carries three satellites for the European Space Agency, the Vietnamese government and university students from Estonia. Liftoff from the European-run Guiana Space Center on the northeast shore of South America is set for Monday night at 10:06 p.m. EDT (11:06 p.m. local time; 0206 GMT Tuesday), kicking off a two-hour mission to rocket into space and precisely maneuver the payloads into their proper orbits. The first launch of the Italian-led Vega rocket in February 2012 was a successful qualification mission for ESA to prove the booster's design. It placed several small low-cost satellites into orbit. 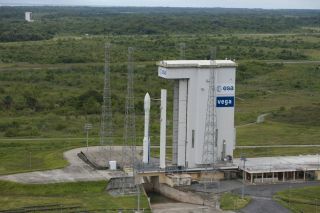 The second flight of the 98-foot-tall (30 meters) rocket is classified as a demonstration mission under ESA's five-launch Vega Research and Technology Accompaniment, or VERTA, program to showcase the launcher's versatility. "Objective No. 1 is demonstrating the extended capabilities of Vega beyond the mission that was performed for the qualification flight," said Antonio Fabrizi, director of ESA's launcher programs. "We want to demonstrate how flexible the launcher is and what we can do with it. In this launch, we want to demonstrate the capability of a double-launch." It is also the first Vega rocket to launch under the oversight of Arianespace, the French company responsible for selling Ariane 5, Soyuz and Vega rockets on the commercial marketplace. "It's a dual launch, and ESA has contracted with Arianespace for launch services," said Louis Laurent, senior vice president of programs at Arianespace. "Arianespace is in charge of the final preparation of the launcher, the acceptance of the launch vehicle, and the combined operations with the integration of the payloads on the launcher. You see the transition from the qualification flight in February  to this flight, where we increasingly play a role in these Vega launches." The Vega rocket has a clear market to launch small Earth observation and research satellites owned by ESA and European governments, but Laurent said Arianespace plans to sell Vega flights to haul a range of commercial payloads into orbit, including imaging satellites and telecommunications platforms. Arianespace scored a commercial customer for the second Vega launch with Vietnam's VNREDSat 1 high-resolution Earth-observation satellite. The deal with EADS Astrium, the satellite's manufacturer, was announced in January. The VERTA program is an investment of 400 million euros, or about $530 million, by ESA to keep the Vega rocket flying through 2015 while the launcher gains visibility and viability in the commercial market. Laurent said Arianespace would like to launch three Vega missions per year. At such flight rates, he said Arianespace could sell Vega flights for 35 million to 45 million euros ($46 million to $59 million) and still turn a profit. Officials made two changes to the Vega rocket and ground segment for its second flight - adding a new ground station north of the launch pad to better track the launcher on its initial ascent from French Guiana, and installing new Italian-developed software and avionics into the launcher to replace a French system used on the first Vega mission, according to Fabrizi. Tonight's mission is the next step in exploiting Vega as an indigenous European launch capability. Officials designed Vega to compete with Russian rockets like Rockot and Dnepr, which rely on decommissioned Soviet-era missile components. After vaulting off the launch pad, the solid-fueled rocket will tilt on a northerly trajectory over the Atlantic Ocean bound for an orbit over Earth's poles. The launcher will accelerate through the speed of sound in about 30 seconds, then release its first stage P80FW motor about 2 minutes after liftoff. Vega's second and third stages, both powered by solid rocket motors, will fire to accelerate the rocket to nearly 17,000 mph, leaving the launcher's Ukrainian fourth stage engine to adjust the rocket's orbit for deployment of three satellites. Four firings of the liquid-fueled fourth stage - named the attitude and vernier upper module - will guide Proba-V, VNREDSat 1 and ESTCube 1 to their target orbits. After two burns, the propulsion module will deploy the 304-pound Proba-V satellite about 55 minutes after launch in a 509-mile-high orbit with an inclination of 98.73 degrees. Another pair of upper stage burns will reduce the rocket's altitude and tweak the orbit's inclination. Vega's barrel-shaped dual-payload adapter, called the Vespa, was built by EADS CASA Espacio in Spain. Once the rocket deploys ESA's Proba-V satellite, the empty hollow structure will pop off to expose VNREDSat 1 for separation. Two hours after liftoff, Vega will release VNREDSat 1 and ESTCube 1 in an orbit 413 miles high with an inclination of 98.13 degrees. The upper stage will ignite a fifth time for a deorbit burn after deploying the satellites. Check out Spaceflight Now's launch timeline for more details.